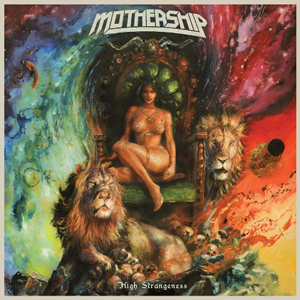 Dallas, Texas heavy rock band MOTHERSHIP will release its new album, High Strangeness, on March 17, 2017 via Ripple Music. Recorded and mixed by Ryan Lee (CRYPT TRIP) at Fire Station Studios in San Marcos, TX and mastered by Tony Reed (MOS GENERATOR/STONE AXE), the album delivers eight strong songs of the band's self-coined "supersonic intergalactic heavy rock". High Strangeness is the follow-up to MOTHERSHIP's 2014 LP, Mothership II, a record that urged The Obelisk to note that, "MOTHERSHIP are locked in and they sound like they know it." Artwork for the new album was created by artist Adam Burke (RUBY THE HATCHET). MOTHERSHIP’s stout sound delivers an amped-up take on '70's heavy rock fury, laced with electrifying psychedelics and space rock elements. The group formed in 2010 when brothers Kyle and Kelley Juett decided to start a new band with their father John Juett on drums. In 2011, Judge Smith would assume drum duties and the trio began to hone its heavy, blues-based sound by performing live at every opportunity. Non-stop road warriors, MOTHERSHIP has risen to headliner status in 2016 and is the go-to opener for D-Town's national touring shows, having shared the stage with SLAYER, ALICE IN CHAINS, GHOST, BARONESS and more in the last twelve months alone. The band was named Dallas' Best Metal Act at the 2016 Dallas Observer Music Awards, earning the honor amidst a strong group of contenders that included TRUE WIDOW and PINKISH BLACK. "Our third album is fueled by the very supersonic intergalactic heavy rock and roll music that brought us together," comments bassist/vocalist Kyle Juett. "We are confident that this new batch of tunes will fire up those who are already on board with us and motivate others to take a "trip on the ship" as well. These songs perfectly capture what will be the next chapter in our ongoing saga across this great planet and beyond. We are now playing a few new songs in our live set, so come out and hear ’em before they are released!"